This well presented, two bedroom ground floor apartment is situated on a small development of 11 properties in a quiet residential area of Kissonerga. The property is within easy walking distance to the many local amenities Kissonerga village enjoys, including, mini-markets, pharmacy, bakery, shops, bars and restaurants. The town and local beaches are a few minutes drive away. Being situated on a corner plot, the property is semi-detached and benefits from having a spacious outdoor leisure area with a fabulous rural/coastal aspect and plenty of space for alfresco dining, sunbathing and fully enjoying the wonderful outdoor life. At the entrance to the property is a covered veranda with wide sliding doors, part of which is currently used as a useful storage area. In good condition throughout, the living accommodation features an open plan living room with cosy lounge, dining space and modern fitted kitchen with quality appliances. Sliding patio windows provide easy access to the partially covered terrace and landscaped garden. Through a decorative archway is an inner hallway leading to the bedrooms, both of which have fitted wardrobes. The master has a large en-suite shower room and a separate family size bathroom is accessed directly from the hallway. To the front of the complex is a crystal clear swimming pool with surrounding sunbathing terrace and shower, toilet & changing facilities is available for the use of the residents. 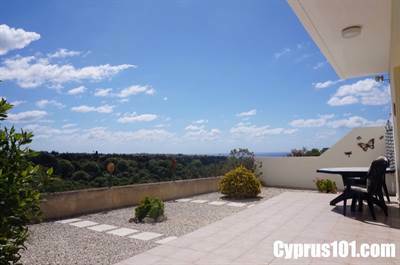 The property is highly suitable as both a permanent residence or holiday home, comes fully furnished and has title deeds. It’s a perfect option for those looking for a more quiet residential setting, great views and close proximity to local amenities.